Happy Fiber Friday! I've got a few yarns to show off that I spun up this week. The first one: Rosebleed. This was spun from Chasing Rainbows Dyeworks fiber I got from a friend - the label was lost and I don't know the content but it is incredibly soft. It's a 2-ply that came out a bit thicker than I hoped but it's still pretty, in a bruisy kind of way. 3.8 oz. 80 yards. Next up: I see you. 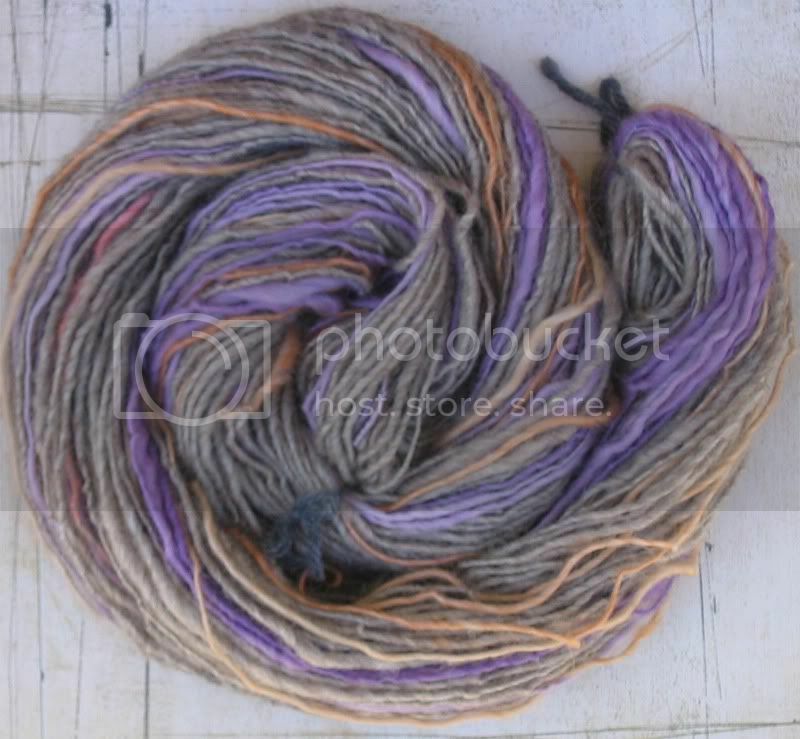 This is a singles yarn spun from natural colored wool, hand-dyed purple and tan mill ends, and mohair. 3.6 oz. 121 yards. The third yarn down is called Volcano. This yarn is made from natural chocolate brown merino, hand dyed pale blue and orange mill ends, orange mohair and recycled sari silk, plied with cotton crochet thread strung with 75 glass amber beads. It reminds me of a volcano erupting on a clear day. 3.6 oz. 132 yards. 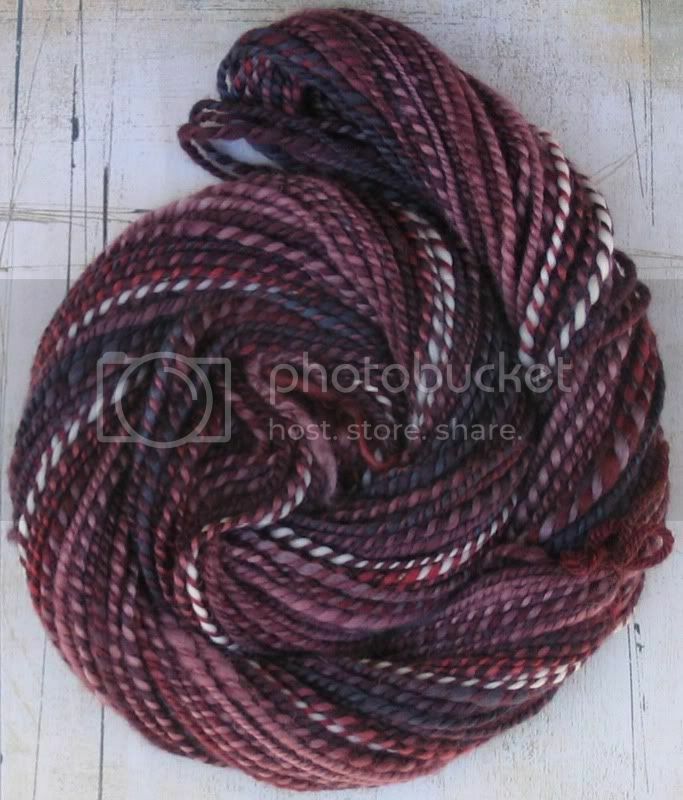 I spun a yarn last week called Canterbury. 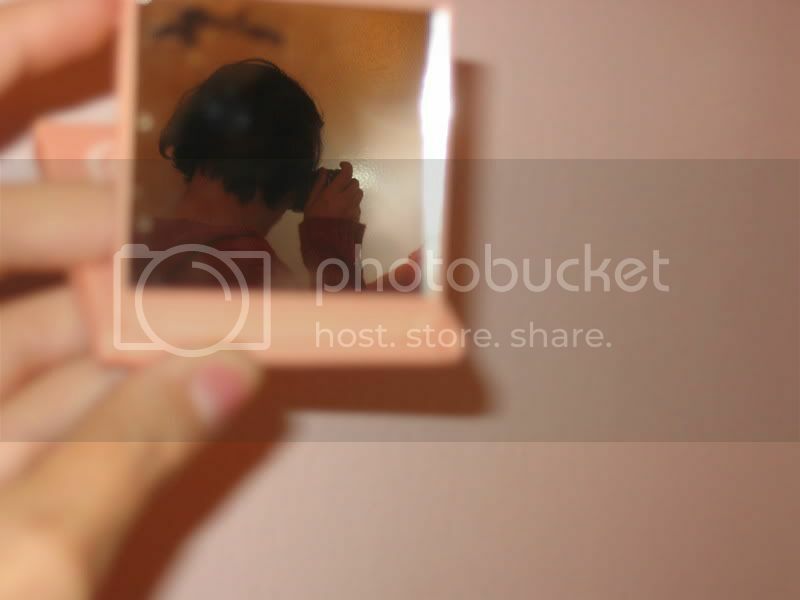 This week I've got Canterbury Junior. This yarn was made in the same way and used the leftover roving... I still love these colors! 2.3 oz. 90 yards. The last yarn here is called July in the Alps. That's where the Tour de France was when I spun it. 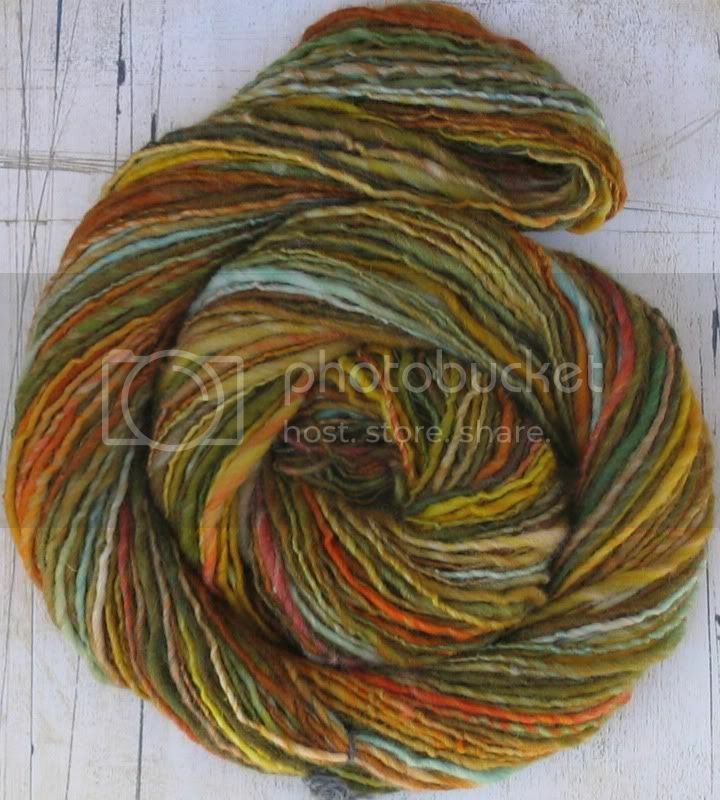 You may recognize the colors, as it is from the same roving as Canterbury. 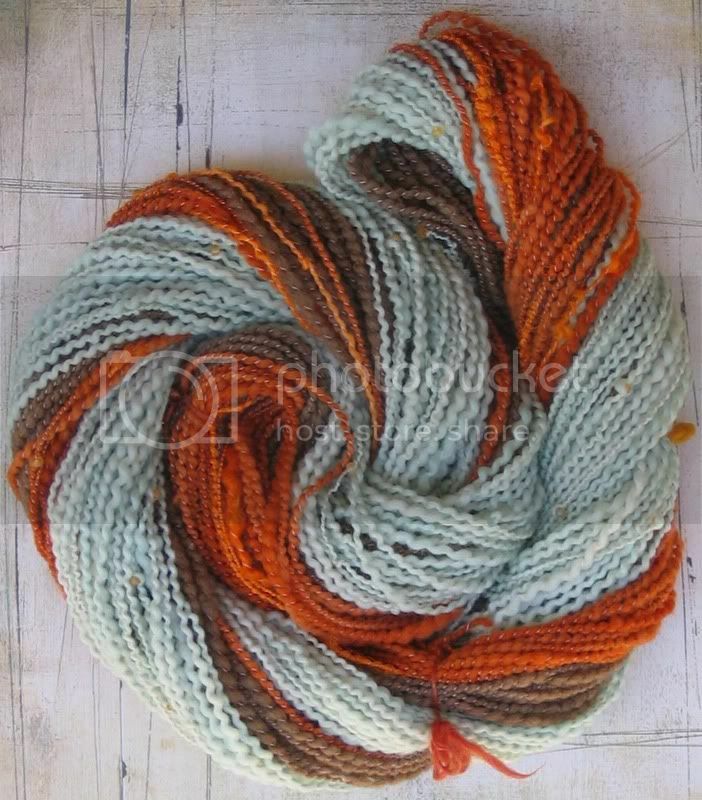 Reminder: the roving I bought at Black Sheep Gathering from Ronnie's Homespun. This was dyed by her 9 year old grandson. It's a somewhat energized single. 3 oz. 122 yards. That's this week in spinning. I hope this Friday is kind to everyone... keep on spinning in the free world! How do you do it? Beautiful creations and clever names to go with them. You are so-o-o-o talented! A Spin-in is being planned for August 25 in L.A. and discussed on Ravelry. Wanna come? I'm still on the waiting list for ravelry! 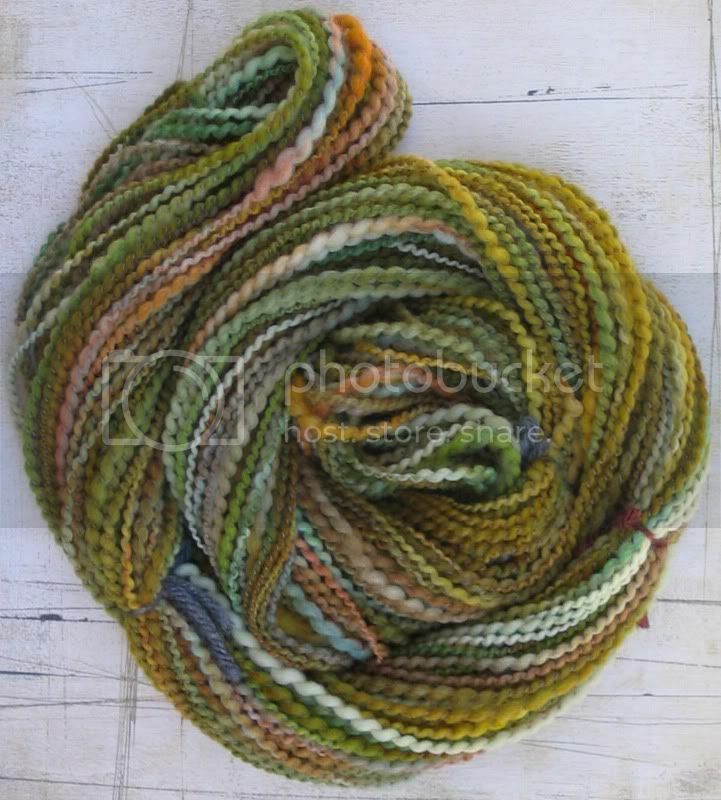 I sent the veggie yarn along with 2 older yarns I spun a couple of months ago. Hope all is well with you too! Nice to hear from you! I am totally amazed by all you've done!